The Georgia state seal identifies government buildings and officials and is a centerpiece for the Georgia state flag. 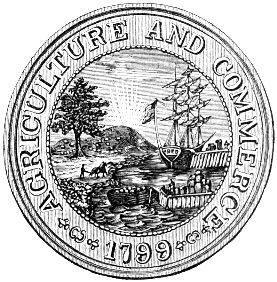 The symbolism, history and emblems of the Georgia seal are described in this article with fast facts and information. The pillars represent the three branches of government: legislative, executive, and judicial. The pillars are guarded by a militia man wearing clothes dating from the American War of Independence standing with a drawn sword representing the defense of the Constitution of Georgia. In heraldry a pavilion symbolizes readiness for battle. 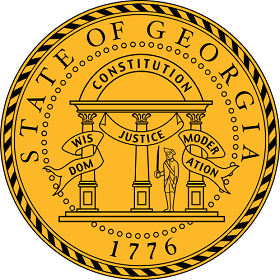 The Great Seal of Georgia is kept and used as required by the Constitution and laws of the state. A tobacco hogshead was a large wooden used in colonial times to transport and store tobacco. This is a banner showing the 1876 design of the seal. In this representation the pillars house images of the goddesses of Wisdom, Justice, Moderation. The lifestyle of the first people of the state are depicted as the Native Americans fishing and workers in the fields.